The sun sets as Coast Guard Flight Mechanic AMT Nick Gilkinson, left, and Rescue Swimmer AST Scott Garren, right, look out the helicopter door at flooded land during a flood relief mission in Brunswick County, N.C., Monday, Sept. 17, 2018. 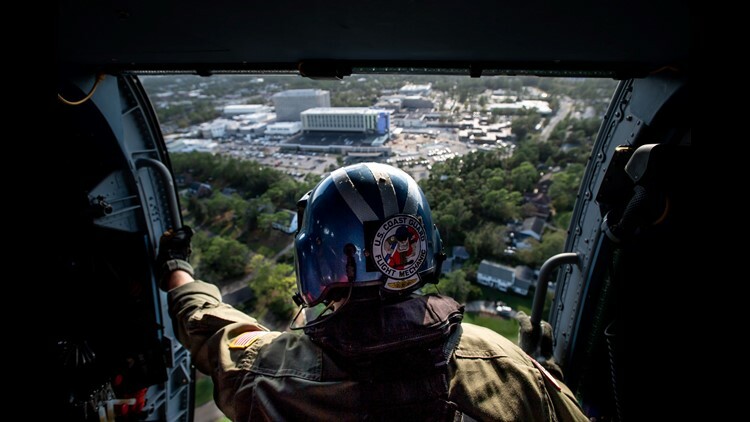 Coast Guard Flight Mechanic AMT Nick Gilkinson looks out the door as the helicopter lands to drop off a patient at the New Hanover Regional Medical Center in Wilmington, N.C., Monday, Sept. 17, 2018. 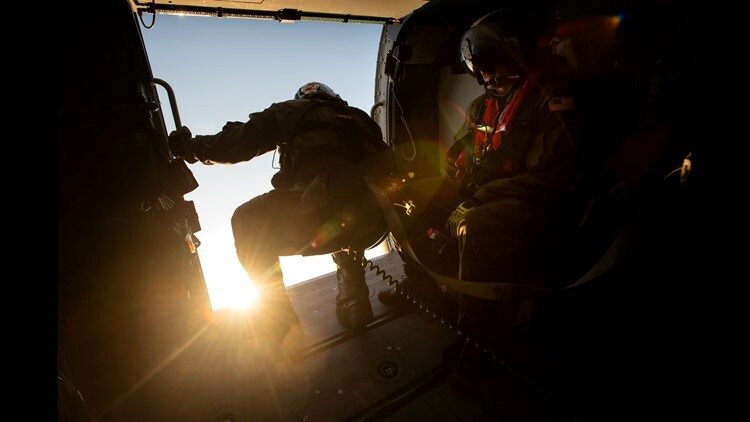 ABOARD A JAYHAWK OVER COASTAL NORTH CAROLINA – From hundreds of feet in the air, the U.S. Coast Guard helicopter spots boats navigating through large swaths of water. The tops of roofs are the only sign that the area in Brunswick County is a neighborhood instead of a river. 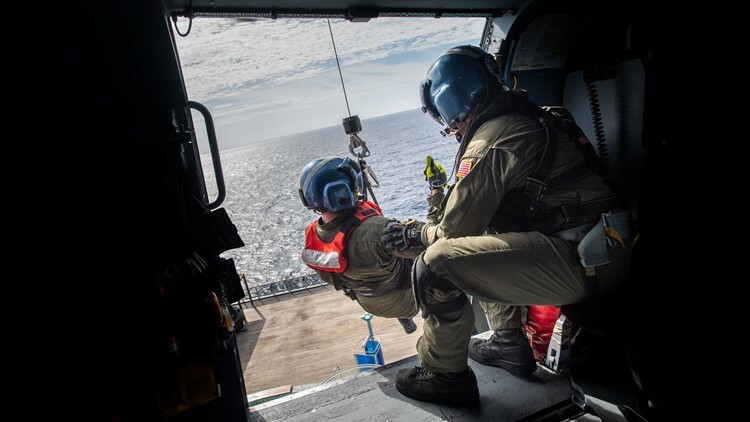 The four-member crew scans the waters from their MH-60T Jayhawk, scouting for anyone trapped or needing help. While Hurricane Florence has moved on, rivers are rising and life-threatening floodwaters could pose a danger for days or even weeks. The Coast Guard crew from Clearwater, Florida, is ready to help. Flight Mechanic Nick Gilkinson leans outside the helicopter from the open-side door, examining a sinkhole that swallowed one road and a dam that broke and washed out another street. A trampoline floats by; a blue above-ground pool is surrounded by brown water. From so high, trees look like bushes and pools look like puddles, but the crew is still able to zero in on people on the ground. And it isn't just about rescues: Crew members also give emergency officials a chance to get a bird's-eye view of the devastation to help figure out where to direct attention and resources. “I think everyone who joins up has the same mission and this response showcases that,” First Pilot Justin Pacheco says. Coast Guard Flight Mechanic AMT Nick Gilkinson climbs into a MH-60T Jayhawk helicopter after dropping off a patient at the New Hanover Regional Medical Center in Wilmington, N.C., Monday, Sept. 17, 2018. Inside the helicopter, supplies such as CPR masks, ropes and cutters are tightly packed along the sides and labeled in black compartments. The crew is also equipped with items such as an ax and flippers. While the hurricane has placed a spotlight on the Coast Guard and the hundreds of rescues its boat and air teams have made, many people don’t recognize the work crews do in their local communities every day, Pacheco says. “We’re the best-kept secret in the military,” he says with a smile. 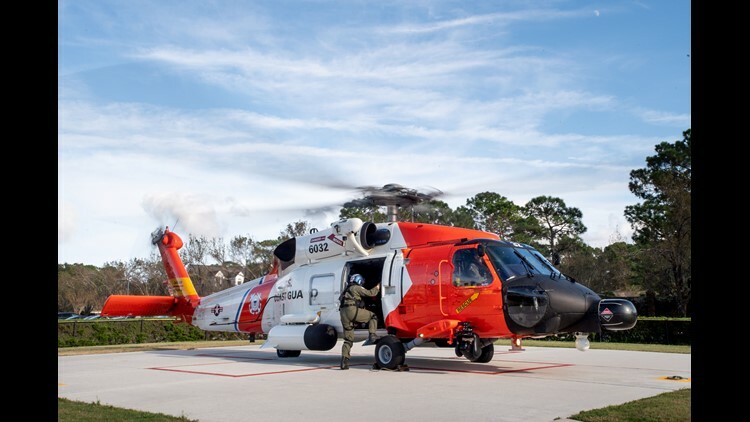 The variety of missions is evident Monday when the Coast Guard crew is called upon to rescue a woman who had suffered a heart attack on a Carnival cruise ship. The Jayhawk quickly diverts from surveying hurricane damage to travel about 100 miles off the coast into the Atlantic Ocean. Coast Guard Flight Mechanic AMT Nick Gilkinson, right, lowers down Rescue Swimmer AST Scott Garren, left, to retrieve a patient from the Carnival Pride, Monday, Sept. 17, 2018. Gilkinson readies a large metal basket with two bright orange preservers attached to the top and a line to hoist down rescue swimmer Scott Garren. The helicopter is positioned above the stern of the ship near a pool and jacuzzi. Garren gives a thumbs-up before he is lowered to it. The woman and a nurse from the ship are loaded into the basket and raised into the copter and the aircraft heads for shore and the nearest hospital. “I certainly didn’t expect that,” Garren says. But like most days, crew members never know what missions they’ll be assigned. As the sun sets, the lights from the helicopter reflect in flooded waters below. Neighborhoods are darkened except for a few vehicles trying to forge through the Florence-ravaged countryside. The number of rescues done by air has slowed as people are heeding advice to stay off roads until flooding subsides. After a long, seven-hour day of flying, the Jayhawk is heading back to base. But the crew will be prepared to take off again – for whatever the mission. “This is what the Coast Guard is all about: helping people in local communities,” Pacheco says. 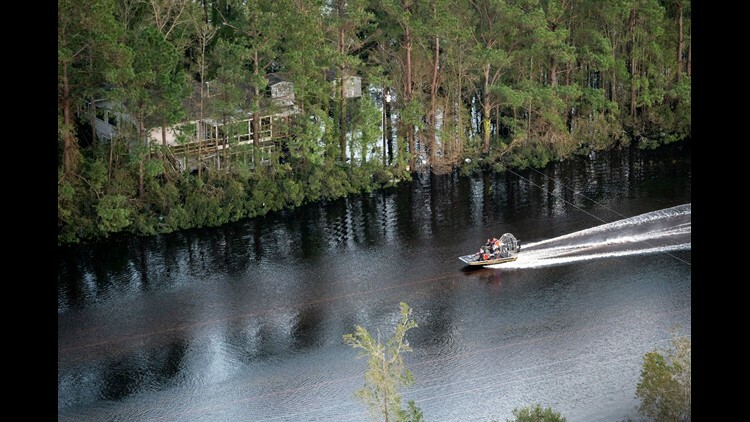 A boat passes down the flooded US-17, as seen from a Coast Guard helicopter, in Brunswick County, N.C., Monday, Sept. 17, 2018.